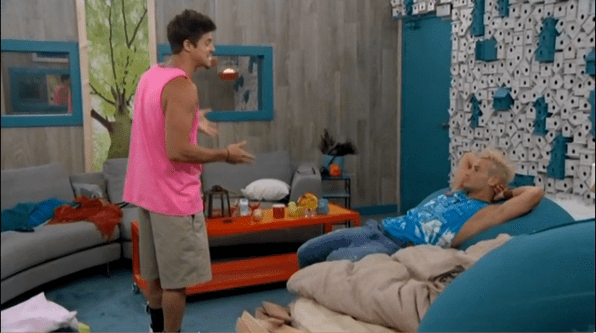 Big Brother 2014 Live Recap: Episode 15 – Zach Attack Takes Over! Who is ready to see a new week of Big Brother 2014 start tonight? We pick up where things left off last time at the live eviction show on Big Brother 16 and see the new Heads of Household crowned for Week 5. Zach was one of the winners and it looks like we will have Zach Attack on Big Brother 16! Watch it with us tonight during our Big Brother 2014 Live Recap and see who won Battle of the Block on Big Brother 2014 tonight! If you are one of those people that refuse to read any of our Big Brother 2014 spoilers and you only watch the shows on CBS then you have no idea what has happened since the show ended on Thursday night and Frankie and Zach won HoH for Week 5! If you do keep up, then you know all the excitement that has happened since then and the drama and tears that are hopefully shown tonight! We have Week 5 nominees being announced tonight and end with the Battle of the Block competition! Here we go…Derrick said he couldn’t take away the picture of his grandpa, so he threw it to him. Then we see more tears from Frankie and then Zach said his target is Amber! With Brittany gone, Donny thinks it is him, Jocasta and Victoria they throw up and toy with! Frankie and Zach talk about their nominations and they want Amber gone this week. Frankie doesn’t want blood on his hands and Zach doesn’t care and wants to piss off Caleb. Zach talks with Caleb and said Amber is the target and she is targeting the guys. Caleb thinks she forgets who is keeping her in the game. Um, herself? She wins comps and he doesn’t! Caleb talks with Amber and all she has to do is smile and he is done for…he is so pathetic! Zach and Frankie get their HoH rooms and Frankie gets pictures of his grandpa and it is nice to see. We then see Zach talk with Frankie and Christine and Zach wants to put up Amber and Christine and have her throw it, but she is not having it. He wants her to earn stripes for the team, but who would want to go on the block??? Zach is getting pissed! Caleb hates pickles, but Amber teases him about going on a date if he eats one! He won’t let it go, as he eats a pickle later on! He gets the date, after Frankie convinces her to go. This is the most awkward date ever. He says one thing and she says “yeah” or says the opposite. She said it is her first and last date, but he thinks it is the best date ever. How can he not catch on? Frankie, Zach and Cody talk and they want Amber out. Zach loves stirring up drama and he is still pissed about Christine saying no and they don’t understand why he wants one of his own alliance on the block. He is starting to get a little wild and no one trusts him or do they know. Now Zach talks with Nicole and tells her the plan and Christine not going on the block. He thinks Nicole is gullible, but then she kind of plays him and gets him to hint at more and more alliance info! Now Nicole goes to Christine and tells her what Zach said. Christine denies anything with Zach and poor Nicole is sad if Christine is screwing her over! We see Derrick and Cody talking and they are working their F2 deal, but know Zach is a liability and Derrick said too many people still in The Detonators. They pick The Hitmen for their alliance name, but didn’t this happen a long time ago??? TEAM AMERICA MISSION: Donny gets the mission, which is to have two HGs to have a heated argument for 20 seconds or longer at the Nomination Ceremony or Veto Meeting. Of course, they will use Zach to start the fight. In the HoH, Zach is working on his speech for the Nominations Ceremony. Derrick and Frankie are encouraging him on to say bad things about Christine. Amber is worried about Zach coming after her, so she goes to talk with him at 5:00am! Zach acts like everything is fine, but he won’t nominate her because she is the backdoor target! NOMINATIONS CEREMONY: Frankie is first and he nominates Jocasta and Victoria. Zach is second and he nominates Christine and Nicole. Zach proceeds to call Christine a floater and Nicole a fruit loop dingus and gets no reaction from them. They actually laugh it off and thinks he is crazy! Team America fails their mission, but still have the Veto Meeting. Nicole gets emotional afterwards about what Zach said and starts crying. Donny thanks Zach for not nominating at him. Christine and Zach talk and she said she is not pissed about his speech, but about running his mouth to Nicole the day before. He denies it, but Christine said he is lying and it is cute denial. Frankie wants to stay HoH and mentions maybe backdooring Zach, but just to keep Nicole and Christine happy. I think Cody wants Zach gone now on Big Brother 2014! BATTLE OF THE BLOCK COMPETITION: It looks like a wedding scene for tonight on Big Brother 16! They will build a giant wedding cake and then have to crawl to the top and stand on top for at least three seconds. There are plastic and squishy pieces. Nicole and Christine are moving quickly and nicely. Victoria and Jocasta are not doing well and Victoria is not listening at all! They both start climbing up, but Victoria falls off and they gotta build again! Nicole and Christine get up there and win Battle of the Block for Week 5! Jocasta seemed to do decent, but Victoria is worthless. Nicole and Christine come off the block and Zach is dethroned as HoH. Jocasta and Victoria remain on the block and Frankie is the lone HoH for Week 5. Have I missed an episode, a conversation (not on BBAD) or a Comment??? Has no one actually told Caleb and Amber that the Bomb Squad no longer exists??? Caleb even still talks BS in the DR. That is so Wrong, yet so Right!!! And i don’t mean Bomb Squad. Waders?…..They’re stacking it so high they need full body condoms to keep from drowning in it!! I am rolling on the floor just picturing that in my mind! Yeah, he is so delusional that he still think it exists! Caleb is out of touch with reality–my favorite bit tonight was his saying that he is the reason Amber is still in the game. Since there is about zero chance that he will get the big check at the end, I wish the powers that be would have Julie give him a very special check when he walks through the door–A REALITY CHECK!! Downright scary if you ask me Mary. They both have very bizarre personalities. Caleb is a stalker and Zach…well I just know what to think about Zach! Zach just wants to cause drama and probably thinks it will get good camera time. He has even admitted to being bored in the house and just wants to do some of the wild things for fun! Well, it would appear, mission accomplished. Did dr evil coach Zach? I really don’t understand the hangup with wanting Amber gone so bad this week. Zach or Caleb seem like a better plan to me. I think they just want to get all the females out of the house first. I still think that if things continue in this path, it will definitely be Frankie, Derrick, Cody, Zack and Caleb for final five. Once the females are all gone they’ll get Donny out. Then they’ll have to fight it out amongst themselves. What a crazy rollercoaster rise this has been this season. It’s making me feel dizzy just trying to keep up with all their silly shenanigans! Their thinking is that Amber controls Caleb. And Caleb will be easier for the Detonators to control once she is gone. Plus she attempted a girl alliance with Nicole and Christine (which the nutty Christine told them about). Add that to the fact that she wants Zach out. And even though he’s a wildcard , he will vote the way the guys do until it’s no longer possible. I think she’s smart for wanting Zach out. And why do the guys think that it’s okay for them to have an alliance, but not the girls? I think that’s a stupid reason to get rid of someone. You want to keep people with you that the others hate. As many seasons as this show has been on the air, it seems like they always choose people that have never watched the game. Unbelievable! The girls are stupid. They think the boys are going to carry them so they form alliances with them. Meanwhile the boys are making alliances amongst each other that don’t include one girl. And the girl’s are running and ratting each other out for wanting to form all girl alliances. It’s sad that there is no solidarity there and it’s the sole reason Joey got sent home so early. It’s even more sad that so called super fans among the girls don’t know better by now. There are no superfans among the girls. They call themselves that but a true superfan would not only know how to execute a strategy but would actually HAVE ONE!!! When Christine and Nicole talk about past seasons they usually get the facts wrong. Except for BB15 – that one they seem to know by heart. Which explains why Christine is picking up where Andy left off. I would never call either of them a superfan. I would call them highly interested fans that love the drama but have no idea what a strategy looks like. Well, maybe they DO know what a strategy looks like. The Floating strategy. They’ve adopted the one strategy most hated by fans. Which tells me they couldn’t possibly be superfans or they would know this. WTH happened to all that potential girl alliance togetherness talk that all the girls swore they were going to attempt in their pre-interviews??? Oh wait….there it is…..circling the bowl as we speak. Perfect analogy–I fear they are all going down the drain with all their talk soon. And I agree with your assessment of Christine–she has certainly taken on lots of Andyisms. Yuck! Is she so naïve that she thinks the guys are going to keep her around til the end?! Is it my imagination, or do Caleb and Amber still believe they are part of the Bomb Squad, even though it no longer exists??!! That is so Wrong, it is Right!!! The “BS” is still very active only it’s not the Bomb Squad–it’s real “BS”!! BTW, Jon, I think my fingers got ahead of my brain and I mistakenly clicked on the down arrow instead of the “reply.” I did give you a thumbs up! Just checked and I did get the thumbs up arrow. Either the award for “most makeup brought into the house” or the award for “most crying scenes in one season”. Yeah, it’s like her personality comes out in the DR, but then in the house she does nothing! I know–I wish she would get with it cause I think she could be a lot of fun. While foolish in some way I respect Zach trying to get blood on his hands. I hate when people try to avoid it so much. At some point you have to get blood on your hand if you want to win. Next time he just needs to plan it better. I really hate the Frankie is HoH because he will just waste it on two easy targets or what the house wants. I kinda agree with you about Zack not caring if he gets blood on his hands. As crazy as he is, I still kinda like him. I don’t eant him to win by any means, but he is fun to watch and brings some much needed entertainment. At least with Zack, we will still be able to “expect the unexpected.” I think he is really our only chance. I have officially stopped caring who wins this year. Thats a first for ne in 15 years. I gave always had a favorite HG. Impossible to believe that anyone has ever seen the show. The girls are giving it away, begging not to win. Remember when everyone hated Rachel??? Oh, to have her back with this group. She would literally mow them down, inckuding the men.oh, also agree with you about Frankie and Justin Bieber. Sighs. No more Rachel worst player in bb history she was just given enough chances and help from production to win. I think Derrick is mowing everyone down, but CBS never shows it! Everyone is making his moves. I agree Todd. It’s been hard for me to root for anyone this year, but I do like Derrick. He’s a very smart guy and he knows how to dumb it down. I like that he’s working with Cody too. Cody is pretty smart and he’s my second choice. Other than those two guys, I don’t really like anyone else. I do like Donny, but I don’t see him making it too far, once all the girls are gone. So it’s team Derrick and Cody for me. At this point I kinda want Victoria to win HOH next week. I knoe, I knkw! just hear me out for a minute. Victoria isn’t aligned with anyone in the house, but I’m fairly certian she wouldn’t put up any of the girls or Donny (he’s nice to her) or Caleb & Hayden because they both have given her POV. So that would be two Detenators on the block. Cody and Derrick are doing a good job of controlling the house and nominations using Frankie as the messenger, but I Don’t think anything theu say would sway Ms. Priss to put up anyone they try and tell her to. In fact, I think them trying to convince her to go with their plan would do more damage than good. I’m guessing she would put up Frankie and Cody, with Derrick or Zach as a backup if needed after POV. She would put up the “power players” just to try to prove her worth in the game. I don’t think that at this point in the game anyone else would have the balls to put up anyone, much less two people, that are that big of a threat to their game. Everyone else would (possibly) put up a threat and Victoria! There aren’t a whole lot of things in BB worse than the wrath of a diva scorned. A detenator gone would even things out in the house a bit, and possibly give the other HG’s a clue of their allaince. And maybe it would open up a door to forming an alliance on the “weak” side of the house. I’m lookong at you, Donny, Nicole and Hayden! I’m probably giving them too much credit, but I think it’s a good idea, plus the only person getting the God forsaken blood on their hands is Victoria. I like your scenario but the only thing i would disagree with you about is Derricks influence over Victoria. It is massive. I have said this before and i will say it again….she has a crush on him. And not only has he dusted her but he has provided rose colored glasses for her to wear whenever they’re together. If by some chance she did win HOH i would think she would put Zach and Nicole on the block. Zach because he’s a bit too crazy for her liking. Did you happen to catch her telling him that his mother would not approve of his actions? It was LOL worthy. And i think Nicole would be her target also because Nicole is incensed at her sleeping in the same bed as Hayden the other day. He had his arm around her. And the cat fight is going to begin soon between the 2 of them. I would love to slap both of them upside the head with one of the Have-Not fishes. And tell them to SNAP OUT OF IT!! There are 500,000 reasons why they should be working together instead of worrying about which one gets the guy. I’m totally disgusted by the girls this season. Jon..”Rachel, worst playerbin BB history? WHY. At least she didn’t just lay down and do nothing. GREAT in comps and didn’t let anyone control her vote. These girls won’t make a move of any kind. Surely, there were many players you could find for the dubious honor of worst player in BB history!!!!!!! Adam – the winner of season 9 – in my opinion the worst winner in BB history. I watched a bit of BB After Dark last night/early this morning and I found it quite interesting how friendly they all were to each other – no game play at all. I don’t know how anyone else feels about Christine, but I think she’s a rat, and I don’t like her. Being a rat is never a good thing. When you run and tell someone what someone else told you, all you’re doing is affirming to the person you’re telling is that you cannot be trusted. Nicole is sweet, but she’s far too oblivious to be on BB. She didn’t pick up on the clues that Zach was hinting to her about Christine? Really! If I were on BB I’d do the opposite of what everyone else does, because it clearly doesn’t work out for them. It’s been tried over and over again, with no triumphant outcome. What I’d do; if someone asked me what so-and-so said about them, I’d say “they like you.” “They’re not going after you, there going after so-and-so.” That way I could put a target on the backs of the HGs that I want out of the house, and maybe save the HG that I want to take to the end with me from eviction. I’d keep Victoria! I don’t like her, because she’s a floater, but neither does anyone else. Commonsense people!. Shirene, I absolutely agree with you about Christine, Nicole and Victoria. Christine is the “Andy” of this season–a title no one should want.